The purpose of this leaflet is to classify lines or sections of lines into categories, which can then be used to determine whether or not wagons shall be accepted on these lines as well as to determine the load limits, on the basis of their geometrical characteristics in terms of axle distances, mass per axle and mass per unit length. Rules for motive power units and other vehicles carry recommendatory status. The 11th edition of UIC Leaflet 700 which takes into account EN 15528 is being finalised, it will be published in the 1st quarter 2019. The corrections are related mainly to some values in Appendices B, C & I and to the withdrawal of Appendix D.
Within the EU (European Union) and for States with a bilateral EU-contract (e.g. Switzerland) EN 15528 is the reference standard. 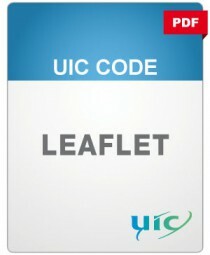 Leaflet 700 is valid for UIC-members outside the EU only. In order to use the most correct values it is also highly recommended to download and use the UIC software tool for payload limits for freight wagons. The tool can be found on our UIC website under the above-mentioned link. This tool is based on the values of EN 15528 and provides exact and optimised values for individual wagons taking into account the actual axle spacing. Administrator privileges are needed to install the software.